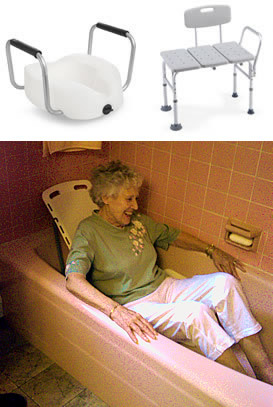 Bathrooms can be dangerous places for falls and accessibility as we age. Ellsworth Medical carries a full line of bathroom safety products such as grab bars, toilet seats, bathroom benches, and shower chairs. One way falls can be prevented is to make homes safer by reducing tripping hazards, adding grab bars inside and outside the tub or shower and next to the toilet, adding stair railings and improving the lighting in homes. Many people who fall, even if they are not injured, develop a fear of falling. This fear may cause them to limit their activities leading to reduced mobility and loss of physical fitness. "Make their homes safer by reducing tripping hazards, adding grab bars inside and outside the tub or shower and next to the toilet, adding railings on both sides of stairways and improving the lighting in their homes." Read more from the CDC about bathroom safety for older adults.